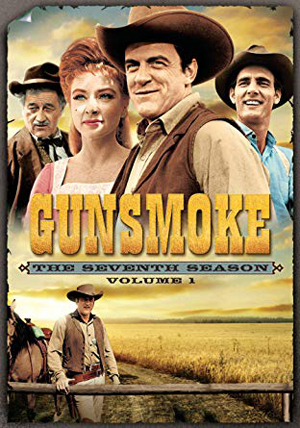 Gunsmoke was riding high as calendar year 1961 rolled in, enjoying the top spot in television for the fourth consecutive season, but all that was about to change. 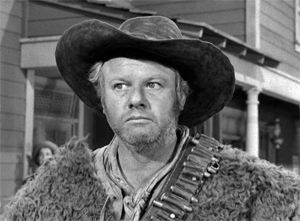 Though the Season 6 episodes continued to fiddle back and forth between its earlier sweeping orchestral theme song and a newer, more dramatic theme copied from Have Gun -- Will Travel, bigger changes came with the advent of Season 7 in the fall of 1961 when the show was expanded from 30 minutes to an hour and co-creator and chief writer John Meston began producing fewer scripts, spreading assignments around to a few other writers. Of these two changes, expanding the program to an hour shouldn't have been the sole reason the series lost its top spot in the ratings because competing shows such as Wagon Train and Bonanza had been 1-hour dramas from the start, and when Gunsmoke faltered in the 1961-62 season from #1 to #3, it was Wagon Train that took over the top spot with Bonanza right behind. Bonanza would eventually take over the top spot itself for three consecutive seasons from 1964-67, so the idea of a 1-hour western in and of itself should not have been enough to topple Gunsmoke. Granted, viewers can be fickle when their favorites are tinkered with in any minor way, but if anything they should have been delighted to have their pleasure doubled, particularly since the longer episodes allowed more time for comic sparring between Doc Adams and Chester Goode. But the reduction in scripts from Meston may be a better explanation for the show's decline in popularity. 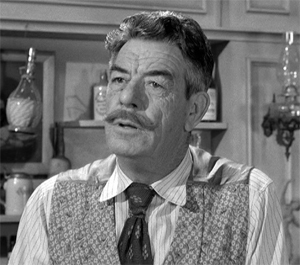 Meston commented himself in an interview that had he known how long Gunsmoke would last, he never would have created it, so it is entirely possible that by the end of Season 6 he had grown tired of turning out so many scripts. The 22 teleplays from Season 6 that aired in 1961 were all written by Meston, even though several of the stories were originated by other authors. Of course, we don't know how much he added to the original stories in creating the teleplays, but the fine details provide a higher level of realism than are found in other westerns of the period and are what make Gunsmoke exceptional. One such exceptional story is "Unloaded Gun" (January 14, 1961), originated by Marian Clark, which shows Matt Dillon ill from the effects of a fever. 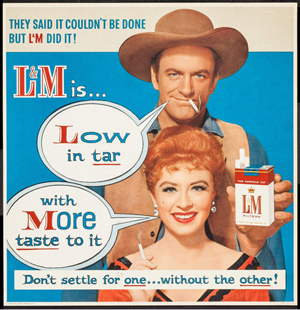 Most heroic lawmen of 1960s television don't get sick, or if they do, they are at death's door, go into a coma, or are unconscious for days before miraculously recovering with everyone telling them how worried they were that the lawman was not going to make it. 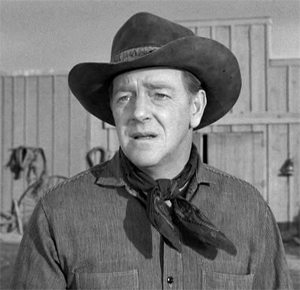 But in this episode of Gunsmoke, Dillon comes back to Dodge having been out on the prairie for several days tracking a gang of criminals who get away, though he thinks he may have wounded one of them, and he has contracted a fever, which makes him dead tired so that all he wants to do is lie down and sleep. He doesn't go into a coma and is never at death's door; he's just very sleepy, which is exactly how people feel when they have a fever. While Dillon sleeps, Chester notices that his gun has gotten remarkably dirty while he was gone, so he unloads and cleans it before putting it back in Dillon's holster. When one of the pursued outlaws shows up in town with the message that he plans to kill Dillon because the man he wounded out on the prairie was the outlaw's brother who subsequently died, Kitty rouses Dillon from his sleep and he automatically grabs his holster and heads for the stable where the outlaw is waiting, not realizing that his gun isn't loaded. 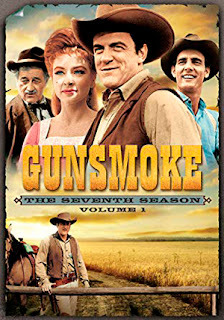 Though he has enough clarity to outwit the outlaw and force him to surrender and throw away his gun, the effort makes him woozy, allowing the outlaw to hit him with a chain and grab his gun, but his attempt to kill Dillon is foiled because the gun isn't loaded, and Chester soon shows up with a shotgun to capture him. Rather than being revved up at barely avoiding death, at the end of the episode Dillon is still so tired from his fever that he plops down in an empty stall and says he just wants some sleep. While the unloaded gun aspect of the story is a little contrived, Arness' portrayal of the sick and tired Dillon is spot on and lends the story an authenticity rare among television dramas of the day. Not that everything Meston produced was pure gold. 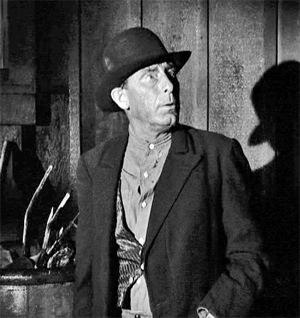 He goes to the well once too often with the trope of an outlaw killing a lawman in another town and then stealing his badge so that he can impersonate him, a twist used both in "The Imposter" (May 13, 1961) and "Colorado Sheriff" (June 17, 1961). And "Harriet" (March 4, 1961) uses a rather tired plot of a daughter who witnesses her father's murder from a hiding spot and then vows to get revenge on the killers despite Dillon's warning against taking the law into her own hands. Another of the less successful Season 6 episodes is "Little Girl" (April 1, 1961), based on a story by Kathleen Hite, about a child orphaned by her drunken father who burns down his own house, forcing Dillon to try to find a suitable home for her. At episode's end she finally reveals that she actually has relatives nearby which she conveniently failed to mention previously because she wanted to live with Matt. This episode fails because it makes the assumption common at the time that merely putting a cute child actor into a thin story will warm the hearts of the viewers. When Meston began delegating writing duties in Season 7, Kathleen Hite was one of the writers chosen to fill in the gaps, and she goes to the cute child crutch again in "Miss Kitty" (October 14, 1916), only this time the child is a boy who is the son of one of her late saloon girls whose father is a notorious outlaw and whom Kitty promised the mother would never be allowed to take custody of the boy. 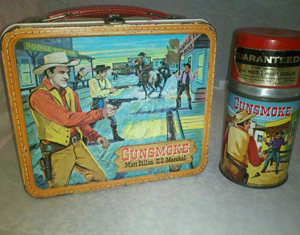 Naturally the drifting outlaw decides he wants the boy simply because he is his, despite the fact that the boy would be of no use to him and would be a hindrance in his continued life of crime, so Kitty tries to hide the boy at an isolated ranch run by some friends and then has to face the outlaw with a shotgun to protect the boy. Everything about the episode is contrived and even the acting rings of phoniness. 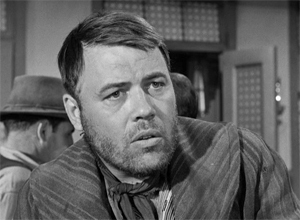 Hite also authored what is undoubtedly the worst Gunsmoke episode of 1961--"Marry Me" (December 23, 1961)--in which Kitty is kidnapped by stereotypically cringe-worthy hillbillies, one of whom is determined to marry her only because his father told him he must marry before his younger brother. But after she is kidnapped and mistreated for days in their mountain shack, once the family patriarch dies from cholera and the son decides not to marry her after all, Kitty gets teary-eyed and without sarcasm calls them kind and gentle people. However, to her credit, Hite also authored one of the better episodes of Season 7, "Chesterland" (November 18, 1961), in which Chester proposes marriage to a young woman he just met and then has to move heaven and earth to try to provide her with an acceptable home. Dennis Weaver's portrayal of Dillon's unofficial deputy is pure comic genius and a clear forerunner to Don Knotts' Barney Fife. In this episode he not only first buys a dilapidated shack in the middle of nowhere, which he thinks he can fix up, but he also plans to farm the obviously hard-as-rock, barren soil, envisioning fields of corn and alfalfa one day. Needless to say, things do not work out as he plans. He breaks his row-digger in trying to till the soil, spills the barrel of water he hauls out from town, and completely levels the shack when he tries to straighten its crooked foundation. But where a wiser man would have thrown in the towel, Chester instead simply adapts, deciding to construct a dugout as a temporary shelter until he can build a proper house despite Doc's warning that if it ever rains the dugout will flood. Chester's fiance is disgusted by the dugout and thinks he lied to her about fields of corn and alfalfa when she sees the barren landscape. The dugout does indeed flood, but not from rain; he discovers he has an underground well on the property, which is temporarily profitable when he sells water to other local farmers. But as with Chester's other romances, this one is doomed. When his fiance leaves town with all the profits from the well, Dillon tells him he is better off, and Chester agrees while trying to hide his tears behind his coffee cup. Despite this one episode's brilliance, the show's writing could not maintain the consistency achieved when Meston was the primary writer. Hite had produced 5 screenplays during the 1957-58 season, but all were based on stories by Meston. And although the series from its inception had used other writers such as John Dunkel, who produced two of the 1961 Season 7 episodes, the sheer workload of producing a 1-hour weekly series would have been too much for Meston alone to shoulder. As the decade progressed, more writers were brought into the fold, and the ratings continued to slip year after year until the show dropped out of the top 30 entirely for the 1966-67. Ironically, its near cancellation led to a groundswell of support, and the following season it shot back up to the #4 spot. 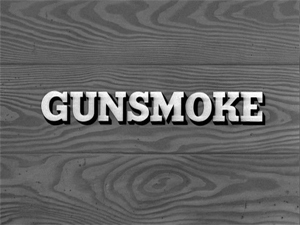 Who knows what might have happened had Gunsmoke remained a 30-minute program for its entirety? No one stays on top forever, but this might be one case where it would have been better to leave well enough alone. As of this post, the first 13 seasons have been released on DVD by CBS/Paramount Home Video. 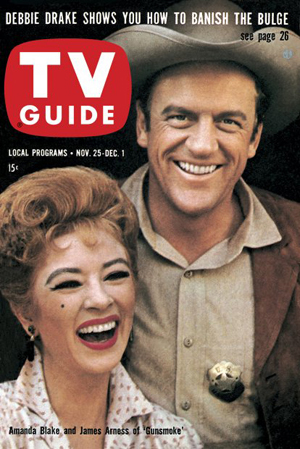 For the biographies of James Arness, Amanda Blake, Dennis Weaver, Milburn Stone, Dabbs Greer, and George Selk, see the 1960 post on Gunsmoke. George Glenn Strange was born August 16, 1899 in Weed, New Mexico, an eighth generation descendent of Pocahontas and John Rolfe as well as a cousin of western performer Rex Allen, but he grew up in Cross Cut, Texas where his father was a rancher and bartender. He dropped out of school after the 8th grade to help his father in his cattle business but after teaching himself how to play guitar and fiddle and performing at rodeo dances from the age of 12 in El Paso, he pursued the itinerant life of a traveling musician, though he also held jobs as a professional boxer, rodeo rider, and deputy sheriff. In Prescott, Arizona he joined up with the musical group the Arizona Wranglers, which brought him to California. There he found work at cowboy star Hoot Gibson's ranch and rodeo and made his film debut as a harmonica-playing cowboy in The Mounted Stranger in 1930. He had numerous uncredited appearances over the next two years until getting his first billed part in John Wayne's The Hurricane Express in 1932. 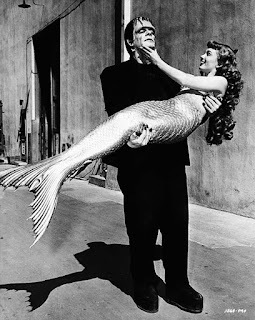 He had dozens of parts in westerns over the next decade, usually playing villainous henchmen or imposing lawmen until he branched out into the horror genre in the 1942 feature The Mad Monster. After Boris Karloff abandoned the role of Frankenstein's monster, makeup man Jack Pierce felt that Strange's facial features and 6'4" build would be a suitable replacement, so Strange stepped into the role of the monster for the 1944 feature House of Frankenstein, followed by House of Dracula in 1945 and Abbott and Costello Meet Frankenstein in 1948. Strange was so convincing as Karloff's replacement that the New York Times accidentally ran a photo of Strange in the part for Karloff's obituary in 1969. Besides continuing to find frequent work in westerns throughout the 1940s, Strange also branched out into other genres such as crime dramas and action adventures features such as Sinbad, the Sailor in 1947. 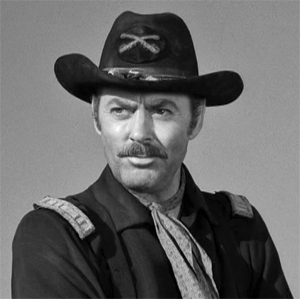 Strange made his debut on television as nemesis Butch Cavendish in four episodes of The Lone Ranger in 1949-50 and soon was receiving guest parts on most of the western TV series of the 1950s including The Adventures of Kit Carson, Annie Oakley, and Judge Roy Bean. 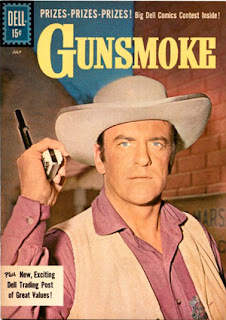 James Arness tried recruiting him for Gunsmoke as early as 1959 because he said he liked playing opposite other tall men, but it took two years before Strange made his first appearance as Sam Noonan the bartender in the episode "Old Faces" in 1961. Strange would stay with the series through the rest of its historic run, appearing in a total of 239 episodes with Arness continuing to support him and provide him work even after his health declined. He finally succumbed to lung cancer at the age of 74 on September 20, 1973. Born in Vassar, Michigan on March 3, 1900, not much is known about Clarke's early years, but by 1929 he had made his way to Broadway, appearing in a production of A Ledge. He found steady work on the stage throughout the 1930s, appearing in productions of The Inside Story, Jezebel, Lost Horizons, and Many Mansions to name but a few. He branched out into television in 1949, appearing in multiple episodes of Kraft Theatre as well as single episodes of The Hartmans and Suspense. He would garner his first recurring role as school principal Mr. Bascomb in the Wally Cox comedy Mister Peepers in 1952-53. He also found regular work on other drama anthologies such as Lux Video Theatre, Armstrong Circle Theatre, and Robert Montgomery Presents. In 1956 he moved to Hollywood and made his first feature film appearances in The Bad Seed and Nightmare. From there, he made frequent TV appearances, usually playing timid or reserved characters such as ministers, doctors, and attorneys. He appeared in The Brothers Karamazov, The Return of Dracula, and I Want to Live! in the latter 1950s as well as scoring occasional western TV guest spots on Have Gun -- Will Travel, Bronco, and Sugarfoot. Clarke made his first appearance on Gunsmoke in 1956, appeared three times as Jim Dobie from 1957-60, and settled into the role of banker Mr. Botkin beginning with the 1961 episode "Potshot." In 1960 he also made the first of three Walt Disney feature film appearances, beginning with the Haley Mills adventure Pollyanna, followed by The Absent-Minded Professor in 1961 and The Monkey's Uncle, which opened in 1965 after his death. He died from cancer at the age of 64 on October 22, 1964. Born in Cleveland, Ohio on May 3, 1905, Nusser's early life has been undocumented, but he reportedly broke into acting on radio and appeared on Gunsmoke first in its radio version. 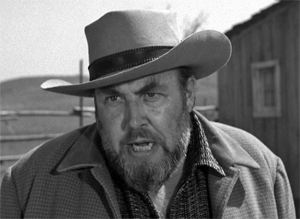 He also reputedly was strongly anti-union and, like his Gunsmoke character Louie Pheeters, an alcoholic, both factors that could have curtailed his acting opportunities. Nonetheless, he broke into television in a 1951 episode of Space Patrol and had his first feature film appearance in an uncredited part as a golfer in Bonzo Goes to College the following year. Though his filmography is not as long as many other character actors of the era, perhaps due to the previously mentioned traits, he had several roles yearly throughout the 1950s and 1960s. He was also reportedly a friend of Jim Backus, perhaps having met him when appearing twice on I Married Joan in 1954-55. Nusser made his first appearance on Gunsmoke in 1956 and had 7 bit parts over the next several years before being permanently cast as Dodge City town drunk Louie Pheeters in the Season 7 opening episode "Perce" in 1961. He would appear over 70 more times in the role through 1970. Thereafter he had only a handful of appearances on other shows in the 1970s such as Mannix, The Waltons, McMillan & Wife, and his final appearance on a 1976 episode of Cannon. He died of natural causes at age 74 on June 8, 1979. Season 6, Episode 17, "Bad Sheriff": Russell Arms (vocalist who regularly appeared on Your Hit Parade) plays Blue Springs sheriff James Hark. 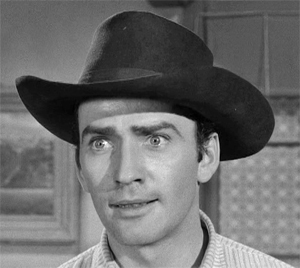 Harry Carey, Jr. (starred in Red River, She Wore a Yellow Ribbon, Mister Roberts, and The Searchers and played Bill Burnett on The Adventures of Spin and Marty) plays his deputy Bill Turloe. Ken Lynch (shown on the left, see the biography section for the 1961 post on Checkmate) plays outlaw Ed Gance. Don Keefer (starred in Death of a Salesman, Hellcats of the Navy, and Sleeper and played George on Angel) plays his partner Chet. Lane Chandler (Tom Pike on Lawman) plays stage office clerk Sam Vestal. Season 6, Episode 18, "Unloaded Gun": William Redfield (appeared in Hamlet, Duel at Diablo, The Fantastic Voyage, The Hot Rock, and One Flew Over the Cuckoo's Nest) plays outlaw Joe Lime. Lew Brown (SAC Allan Bennett on The F.B.I. and Shawn Brady on Days of Our Lives) plays his brother Red. Hank Patterson (Fred Ziffel on Green Acres and Petticoat Junction and later played Hank Miller on Gunsmoke) plays stable owner Carl Miller. 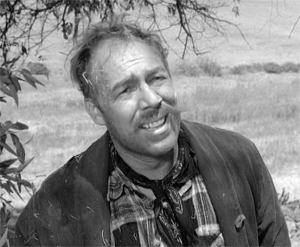 Season 6, Episode 19, "Tall Trapper": Strother Martin (shown on the right, appeared in Kiss Me Deadly, The Shaggy Dog, The Man Who Shot Liberty Valance, Cool Hand Luke, True Grit, The Wild Bunch, Butch Cassidy & the Sundance Kid, and Slap Shot and played Aaron Donager on Hotel de Paree and R.J. Hawkins on Hawkins) plays wagon traveler Marv Rowley. 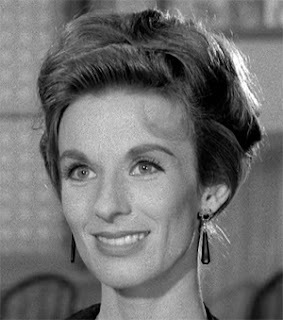 Jan Shepard (Nurse Betty on Dr. Christian) plays his wife Tassie. Tom Reese (starred in Taggart, The Money Trap, and Murderers' Row and played Sgt. Thomas Velie on Ellery Queen) plays trapper Ben. Season 6, Episode 20, "Love Thy Neighbor": Ken Lynch (see "Bad Sheriff" above) plays homesteader Leroy Galloway. Jeannette Nolan (starred in Macbeth (1948), The Big Heat, Tribute to a Bad Man, and The Reluctant Astronaut, did voicework for Psycho, The Rescuers, and The Fox and the Hound, and played Annette Devereaux on Hotel de Paree and Holly Grainger on The Virginian) plays his wife Rose. Warren Oates (starred in In the Heat of the Night, The Wild Bunch, and Stripes and played Ves Painter on Stoney Burke) plays their son Jep. Jack Elam (Deputy J.D. Smith on The Dakotas, George Taggart on Temple Houston, Zack Wheeler on The Texas Wheelers, and Uncle Alvin Stevenson on Easy Street) plays their neighbor Ben Scooper. 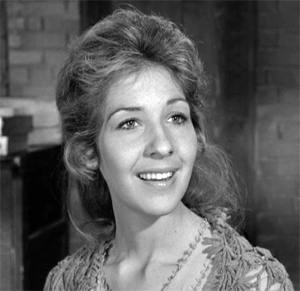 Nora Marlowe (Martha Commager on Law of the Plainsman, Sara Andrews on The Governor and J.J., and Mrs. Flossie Brimmer on The Waltons) plays his wife Jennie. David Kent (Bill Scott on Leave It to Beaver) plays their younger son Peter. Harry Dean Stanton (shown on the left, appeared in Kelly's Heroes, Dillinger, Cool Hand Luke, Repo Man, Pretty in Pink, Alien, Paris, Texas and played Jake Walters on Mary Hartman, Mary Hartman) plays their older son Harley. Cyril Delevanti (Lucious Coin on Jefferson Drum) plays old thief Sy Tewksbury. Season 6, Episode 21, "Bad Seed": Anne Helm (Molly Pierce on Run for Your Life) plays runaway Trudy Trent. 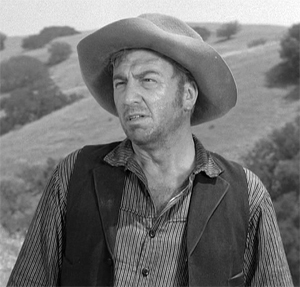 Roy Barcroft (Col. Logan on The Adventures of Spin and Marty and later played Roy on Gunsmoke) plays her father Asa. 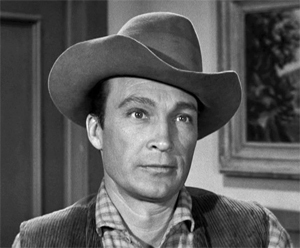 Burt Douglas (Ron Christopher on The Edge of Night and Jim Fisk on Days of Our Lives) plays ranch hand Gar Cline. Season 6, Episode 22, "Kitty Shot": George Kennedy (shown on the right, starred in Charade, The Sons of Katie Elder, The Dirty Dozen, Cool Hand Luke, and The Naked Gun and played MP Sgt. Kennedy on The Phil Silvers Show, Father Samuel Cavanaugh on Sarge, Bumper Morgan on The Blue Knight, and Carter McKay on Dallas) plays stage robber Jake Bayloe. Rayford Barnes (see the biography section for the 1960 post on The Life and Legend of Wyatt Earp) plays his partner Helm. Season 6, Episode 23, "About Chester": Charles Aidman (narrator on the 1985-87 version of The Twilight Zone) plays horse thief Dack. House Peters, Jr. (Sheriff Jim Billings on Lassie) plays rancher Jake Worth. Season 6, Episode 24, "Harriet": Suzanne Lloyd (shown on the left, played Raquel Toledano on Zorro) plays vengeful daughter Harriet Horne. Tom Reese (see "Tall Trapper" above) plays her father's murderer Dan Scorp. Ron Hayes (see the biography section for the 1960 post on Bat Masterson) plays Scorp's partner Webb Hoagler. 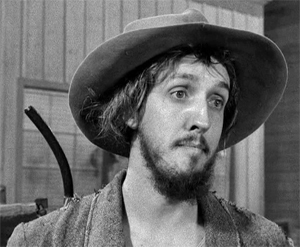 Season 6, Episode 25, "Potshot": Karl Swenson (Lars Hanson on Little House on the Prairie) plays hog farmer Hutch Dawkins. Quentin Sondergaard (see the biography section for the 1960 post on Tombstone Territory) plays one of his drinking buddies. John Harmon (hotel clerk Eddie Halstead on The Rifleman) plays bank teller Carl. Dallas Mitchell (Detective Fisher on The Asphalt Jungle) plays horse owner Bert. Wallace Rooney (Andrew Winters on The Doctors) plays telegrapher Peters. Season 6, Episode 26, "Old Faces": James Drury (shown on the right, played The Virginian on The Virginian and Captain Spike Ryerson on Firehouse) plays newlywed Tom Cook. Jan Shepard (see "Tall Trapper" above) plays his wife Tilda. 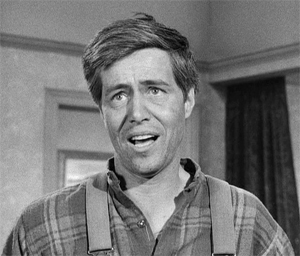 Ron Hayes (see "Harriet" above) plays ranch co-owner Varden. Season 6, Episode 27, "Big Man": George Kennedy (see "Kitty Shot" above) plays bully Pat Swarner. Sandy Kenyon (Des Smith on Crunch and Des, Shep Baggott on The Travels of Jaimie McPheeters, and Reverend Kathrun on Knots Landing) plays his friend Ak Glick. Rayford Barnes (see "Kitty Shot" above) plays his friend Harry. John McLiam (appeared in Cool Hand Luke, In Cold Blood, Sleeper, The Missouri Breaks, and First Blood) plays ex-farmer Jud. Barney Phillips (Sgt. Ed Jacobs on the original Dragnet, Lt. Sam Geller on Johnny Midnight, Lt. Avery on The Brothers Brannagan, Doc Kaiser on 12 O'Clock High, Mike Golden on Dan August, and Fletcher Huff on The Betty White Show) plays bartender Bill Pence. Season 6, Episode 28, "Little Girl": Susan Gordon (appeared in Attack of the Puppet People, Tormented, The Five Pennies, and Picture Mommy Dead) plays orphan Charity Gill. 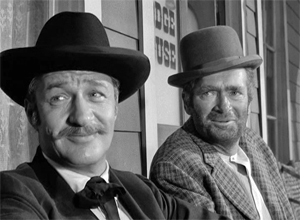 Wright King (shown on the left, see the biography section for the 1960 post on Wanted Dead or Alive) plays overwhelmed father Hi Stevens. Bill McLean (Dave on The Jim Backus Show) plays handyman Rafe. Ann Morrison (appeared in My Pal Gus, Battle Circus, and The Brothers Karamazov and played Dr. Alma on The Young Marrieds and Mrs. Nelson on General Hospital) plays widow Mrs. Henry. Season 6, Episode 29, "Stolen Horses": Jack Lambert (see the biography section for the 1960 post on Riverboat) plays horse thief Tebow. Buck Young (Deputy Buck Johnson on U.S. Marshal and Sergeant Whipple on Gomer Pyle: USMC) plays rancher Jim Redigo. Charles Seel (Otis the Bartender on Tombstone Territory, Mr. Krinkie on Dennis the Menace, and Tom Pride on The Road West) plays his lodger Jed Cuff. 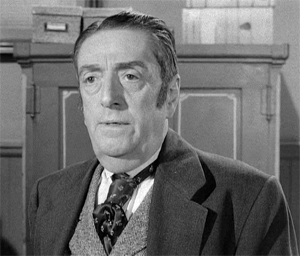 Guy Raymond (Cliff Murdock on Harris Against the World and Mr. Peevey on The Ghost and Mrs. Muir) plays hostage Abe Kurtch. Shirley O'Hara (Debbie Flett on The Bob Newhart Show) plays his wife Lou. Season 6, Episode 30, "Minnie": Virginia Gregg (starred in Dragnet, Crime in the Streets, Operation Petticoat and was the voice of Norma Bates in Psycho and the voice of Maggie Belle Klaxon on Calvin and the Colonel) plays mountain woman Minnie Higgins. Alan Hale, Jr. (shown on the right, played Biff Baker on Biff Baker U.S.A., Casey Jones on Casey Jones, and The Skipper on Gilligan's Island) plays her husband Jake. Barry Cahill (Capt. Curt Douglas on 12 O'Clock High) plays bar patron Pete. Season 6, Episode 31, "Bless Me Till I Die": Ron Foster (Officer Garvey on Highway Patrol) plays settler Cole Treadwell. Vic Perrin (was the narrator on Sergeant Preston of the Yukon, was the control voice on The Outer Limits, and did voicework on Jonny Quest, Star Trek, Scooby Doo, Where Are You?, and Mission: Impossible!) plays drunken troublemaker Nate Busch. Season 6, Episode 32, "Long Hours, Short Pay": John Larch (starred in The Wrecking Crew, Play Misty for Me, and Dirty Harry and played Deputy District Attorney Jerry Miller on Arrest and Trial, Gerald Wilson on Dynasty, and Arlen & Atticus Ward on Dallas) plays gun runner Serpa. Allan Lane (shown on the left, see the biography section for the 1961 post on Mister Ed) plays cavalry commander Capt. Graves. Season 6, Episode 33, "Hard Virtue": Lew Brown (see "Unloaded Gun" above) plays hot-headed husband Andy Coe. Leah Waggner (wife of William Schallert) plays his wife Millie. Robert Karnes (see the biography section for the 1961 post on The Lawless Years) plays freight company owner Ed Fallon. James Maloney (Jim on 21 Beacon Street) plays freight clerk Jacobs. Season 6, Episode 34, "The Imposter": Paul Langton (shown on the right, played Leslie Harrington on Peyton Place) plays homesteader Rob Curtin. 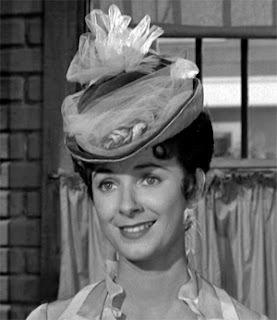 Virginia Gregg (see "Minnie" above) plays his wife Clara. Garry Walberg (Police Sgt. Sullivan on Johnny Staccato, Sgt. Edward Goddard on Peyton Place, Speed on The Odd Couple, and Lt. Frank Monahan on Quincy M.E.) plays ex-Texan Harve Peters. Season 6, Episode 35, "Chester's Dilemma": Patricia Smith (Charlotte Landers on The Debbie Reynolds Show and Margaret Hoover on The Bob Newhart Show) plays new arrival Edna Walston. John van Dreelen (starred in The Leech Woman, 13 Ghosts, and Topaz) plays Iowa farmer Hans Gruber. Season 6, Episode 36, "The Love of Money": Cloris Leachman (shown on the left, starred in The Last Picture Show, Charley and the Angel, Dillinger, and Young Frankenstein and played Ruth Martin on Lassie, Rhoda Kirsh on Dr. Kildare, and Phyllis Lindstrom on The Mary Tyler Moore Show, Rhoda, and Phyllis) plays new saloon girl Boni Van Dieman. Tod Andrews (appeared in Heaven Can Wait (1943), From Hell It Came, and Beneath the Planet of the Apes and played Maj. John Singleton Mosby on The Gray Ghost) plays gambler Miles Cody. Warren J. Kemmerling (Judge Rensen on How the West Was Won) plays former Oklahoma marshal Nate Tatum. Season 6, Episode 37, "Melinda Miles": Burt Douglas (Ron Christopher on The Edge of Night and Jim Fisk on Days of Our Lives) plays young suitor Tom Potter. Diana Millay (Laura Collins on Dark Shadows) plays his fiance Melinda Miles. Walter Sande (shown on the right, appeared in To Have and Have Not, A Place in the Sun, and Bad Day at Black Rock and played Capt. Horatio Bullwinkle on The Adventures of Tugboat Annie and Papa Holstrum on The Farmer's Daughter) plays her father Harry. Charles H. Gray (Officer Edwards on Highway Patrol, Pico McGuire on Gunslinger, Clay Forrester on Rawhide, and Bill Foster on The Young and the Restless) plays Harry's foreman Roy Tayloe. Rand Brooks (Lucky Jenkins in 12 western feature films and on Hopalong Cassidy and Cpl. Boone on The Adventures of Rin Tin Tin) plays horse trader George Rand. Season 6, Episode 38, "Colorado Sheriff": Wright King (see "Little Girl" above) plays gunshot victim Rod Ellison. Robert Karnes (see "Hard Virtue" above) plays Colorado sheriff Ben Witter. Kelton Garwood (shown on the left, played Beauregard O'Hanlon on Bourbon Street Beat and later played Percy Crump on Gunsmoke) plays nester Sam Jones. Woodrow Chambliss (Captain Tom on Yancy Derringer and later played Woody Lathrop on Gunsmoke) plays telegrapher Myles. Season 7, Episode 1, "Perce": Ed Nelson (Michael Rossi on Peyton Place and Ward Fuller on The Silent Force) plays former outlaw Perce McCall. Norma Crane (appeared in Tea and Sympathy, They Call Me Mr. Tibbs!, and Fiddler on the Roof and played Rayola Dean on Mister Peepers) plays saloon girl Ida Poe. Ken Lynch (see "Bad Sheriff" above) plays rich cattleman Seeber. John Mitchum (see the biography section for the 1960 post on Riverboat) plays card player Norm. Season 7, Episode 2, "Old Yellow Boots": Warren Stevens (shown on the right, starred in The Frogmen, The Barefoot Contessa, Deadline U.S.A., and Forbidden Planet, played Lt. William Storm on Tales of the 77th Bengal Lancers, and was the voice of John Bracken on Bracken's World) plays drifter Frank Cassidy. Joanne Linville (Amy Sinclair on The Guiding Light) plays spinster Beulah Parker. Harry Dean Stanton (see "Love Thy Neighbor" above) plays her brother Leroy. Steve Brodie (see the biography section for the 1960 post on The Life and Legend of Wyatt Earp) plays gun for hire Jake Welch. Bing Russell (father of Kurt Russell, played Deputy Clem Foster on Bonanza) plays his partner Henry Head. Season 7, Episode 3, "Miss Kitty": John Lasell (Dr. Peter Guthrie on Dark Shadows) plays outlaw Tucker Ferrin. Roger Mobley (Homer "Packy" Lambert on Fury) plays his son Thad. Frank Sutton (shown on the left, appeared in Marty, Town Without Pity, and The Satan Bug and played Eric Raddison on Tom Corbett, Space Cadet and Sgt. 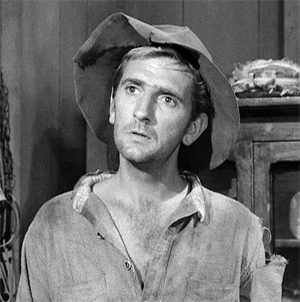 Vince Carter on Gomer Pyle, U.S.M.C.) plays Ferrin's partner Charlie. Harold J. Stone (John Kennedy on The Grand Jury, Hamilton Greeley on My World and Welcome to It, and Sam Steinberg on Bridget Loves Bernie) plays rancher Horace Kelk. Linda Watkins (Robin Crosley on One Life to Live) plays his wife Mattie. Season 7, Episode 4, "Harpe's Blood": Peter Whitney (shown on the right, played Sergeant Buck Sinclair on The Rough Riders and Lafe Crick on The Beverly Hillbillies) plays homesteader Gip Cooley. Rickey Kelman (Randy Towne on The Dennis O'Keefe Show and Tommy MacRoberts on Our Man Higgins) plays his son Kyle. Conlan Carter (C.E. Caruthers on The Law and Mr. Jones and Doc on Combat!) plays his grown son Jeff. Warren J. Kemmerling (see "The Love of Money" above) plays horse trader Neil Carr. Evans Evans (wife of John Frankenheimer, appeared in All Fall Down, Bonnie and Clyde, and The Iceman Cometh) plays saloon girl Jenny Troupe. Season 7, Episode 5, "All That": John Larch (shown on the far left, see "Long Hours, Short Pay" above) plays poor farmer Cliff Shanks. Frances Helm (first wife of Brian Keith, played Susan Ames Dunbar Carver on The Secret Storm) plays his wife Clara. Guy Raymond (see "Stolen Horses" above) plays his landlord Jim Redfield. Harry Lauter (Ranger Clay Morgan on Tales of the Texas Rangers, Atlasande on Rocky Jones, Space Ranger, and Jim Herrick on Waterfront) plays cattle buyer Kyle Terry. Buddy Ebsen (shown on the near left, played Hunk Marriner on Northwest Passage, Jed Clampett on The Beverly Hillbillies, Barnaby Jones on Barnaby Jones, and Roy Houston on Matt Houston) plays drifter Brent Quimby. Harry Swoger (Harry the bartender on The Big Valley) plays Delmonico's owner Hank Green. Season 7, Episode 6, "Long, Long Trail": Barbara Lord (shown on the right, mother of Patrick Warburton) plays soldier's fiance Sarah Drew. Mabel Albertson (Mrs. Whiting on Those Whiting Girls, Irene Brady on The Tom Ewell Show, Mrs. Sprague on The Andy Griffith Show, Mildred Hollinger on That Girl, and Phyllis Stephens on Bewitched) plays Dillon's old friend Gody Baines. Alan Baxter (appeared in Saboteur, Close-Up, and Paint Your Wagon) plays shack dweller Lou Hacker. 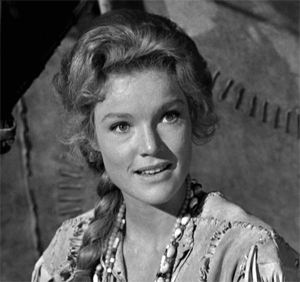 Peggy Stewart (starred in Oregon Trail, Son of Zorro, and Desert Vigilante and played Cherien's mother on The Riches) plays his sister Fan. 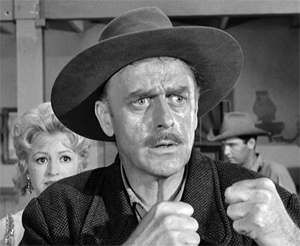 Season 7, Episode 7, "The Squaw": John Dehner (shown on the left, played Duke Williams on The Roaring '20's, Commodore Cecil Wyntoon on The Baileys of Balboa, Morgan Starr on The Virginian, Cyril Bennett on The Doris Day Show, Dr. Charles Cleveland Claver on The New Temperatures Rising Show, Barrett Fears on Big Hawaii, Marshal Edge Troy on Young Maverick, Lt. Joseph Broggi on Enos, Hadden Marshall on Bare Essence, and Billy Joe Erskine on The Colbys) plays widower Hardeman Tate. Paul Carr (Bill Horton on Days of Our Lives, Casey Clark on Voyage to the Bottom of the Sea, Ted Prince on Dallas, and Martin Gentry on The Young and the Restless) plays his son Cully. Robert Hastings (Lt. Elroy Carpenter on McHale's Navy, Tommy Kelsey on All in the Family, and Capt. Burt Ramsey on General Hospital) plays troublemaker Bill Craig. Bill Erwin (Joe Walters on My Three Sons and Glenn Diamond on Struck by Lightning) plays minister Rev. Tucker. Season 7, Episode 8, "Chesterland": Sondra Blake (shown on the right, former wife of Robert Blake, played Erlene on Days of Our Lives) plays Chester's fiance Miss Daisy. Arthur Peterson (The Major on Soap) plays kibitzer Arny. 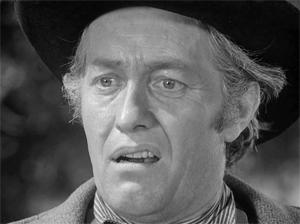 Season 7, Episode 9, "Milly": Malcolm Atterbury (starred in I Was a Teenage Werewolf, The Birds, and The Learning Tree and played John Bixby on Wagon Train and Grandfather Aldon on Apple's Way) plays alcoholic father Bart Glover. Jenna Engstrom (daughter of actress Jean Engstrom) plays his daughter Milly. Sue Randall (see the biography section for the 1960 post on Leave It to Beaver) plays their neighbor Laura. Harry Swoger (see "All That" above) plays bachelor neighbor Sam Lawson. James Griffith (Deputy Tom Ferguson on U.S. Marshal) plays misanthrope Harry Tillman. 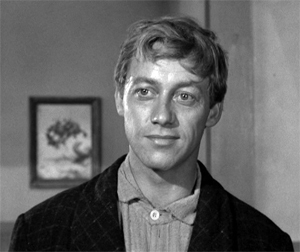 Don Dubbins (appeared in The Caine Mutiny, Tribute to a Bad Man, From the Earth to the Moon, and The Prize and played William Kennerly, Jr. on Peyton Place) moonshiner Ed Potts. 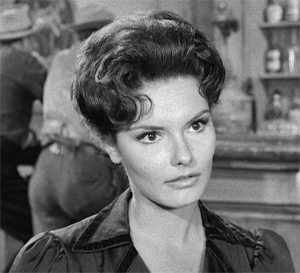 Season 7, Episode 10, "Indian Ford": Pippa Scott (shown on the left, see the biography section for the 1960 post on Mr. Lucky) plays Arapahoe abductee Mary Tabor. Roy Roberts (Capt. Simon P. Huxley on The Gale Storm Show, Admiral Rogers on McHale's Navy, John Cushing on The Beverly Hillbillies, Mr. Cheever on The Lucy Show, Frank Stephens on Bewitched, Norman Curtis on Petticoat Junction, and later played Mr. Botkin/Bodkin on Gunsmoke) plays her father Henry. R.G. Armstrong (Police Capt. McAllister on T.H.E. Cat and Lewis Vendredi on Friday the 13th) plays belligerent army Capt. Benter. Lane Chandler (see "Bad Sheriff" above) plays trapper Gabe Trumbull. Season 7, Episode 11, "Apprentice Doc": Ben Cooper (appeared in Johnny Guitar, The Rose Tattoo, and Support Your Local Gunfighter and played Waverly on The Misadventures of Sheriff Lobo and the Director on The Fall Guy) plays reformed outlaw Pitt Campbell. Robert Sorrells (Seaman Claude White on Ensign O'Toole) plays his former colleague Augie. 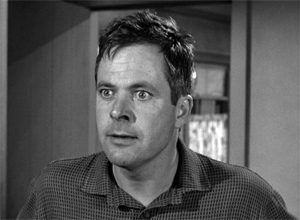 Season 7, Episode 12, "Nina's Revenge": William Windom (shown on the right, appeared in To Kill a Mockingbird, The Americanization of Emily, and Escape From the Planet of the Apes and played Congressman Glen Morley on The Farmer's Daughter, John Monroe on My World and Welcome to It, Larry Krandall on Brothers and Sisters, Frank Buckman on Parenthood, and Dr. Seth Hazlitt on Murder, She Wrote) plays money-hungry husband Lee Sharkey. Lois Nettleton (Sue Kramer on Accidental Family, Joanne St. John on In the Heat of the Night, Virginia Benson on General Hospital, and Evelyn on Crossing Jordan) plays his wife Nina. Ron Foster (see "Bless Me Till I Die" above) plays hired hand Jim Garza. Johnny Seven (Lt. Carl Reese on Ironside) plays hired assassin Harry Blucher. Quentin Sondergaard (see "Potshot" above) plays a bar patron. Season 7, Episode 13, "Marry Me": Cactus Mack (cousin of Rex Allen and Glenn Strange, musician in the bands of Ray Whitley and Fred Scott, announcer for Hoot Gibson's rodeo, and ranch foreman for singer Curt Massey) plays hillbilly patriarch Pa Cathcart. Don Dubbins (shown on the left, see "Milly" above) plays his elder son Orkey. Warren Oates (see "Love Thy Neighbor" above) plays his younger son Sweet Billy. Season 7, Episode 14, "A Man a Day": Fay Spain (starred in Dragstrip Girl, Al Capone, and The Gentle Rain) plays new pool hall employee Bessie Lee. Val Dufour (Walter Curtin on Another World and Somerset) plays outlaw gang leader Nick Cooner. Leonard Nimoy (shown on the right, played Mr. Spock on Star Trek, Paris on Mission: Impossible, and Dr. William Bell on Fringe) plays gang member Elias Grice. Garry Walberg (see "The Imposter" above) plays gang member Hatcher. 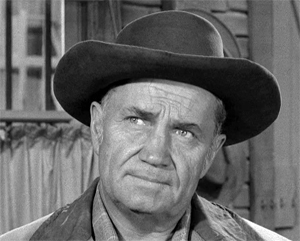 Tom Fadden (Duffield on Broken Arrow, Silas Perry on Cimarron City, and Ben Miller on Green Acres and Petticoat Junction) plays farmer Enoch Miller. 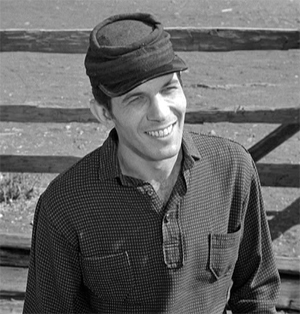 Arthur Peterson (see "Chesterland" above) plays rancher Sam Frazer. Ann Morell (holistic medicine advocate, gospel singer, and music producer, appeared in Tickle Me, Dracula vs. Frankenstein, and Boxcar Bertha) plays his daughter Ana.